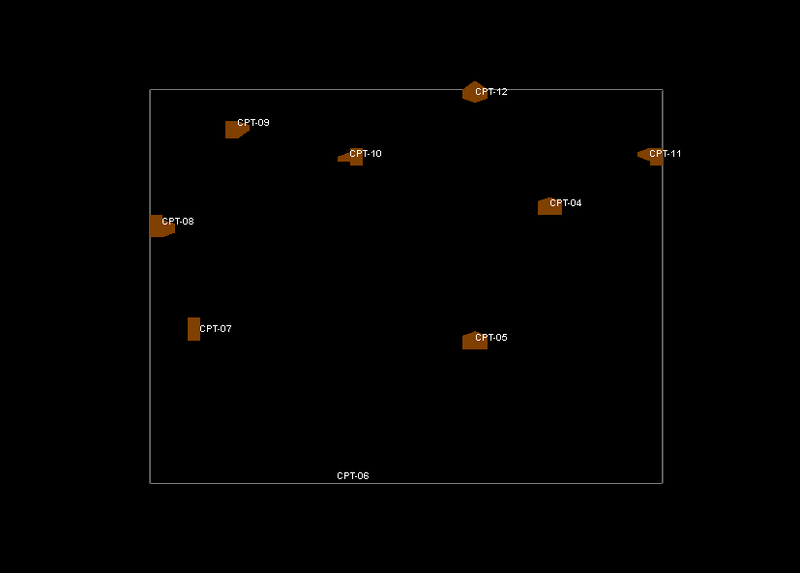 I am generating plan views from above of my 3D solid model in RW15 and need to show borehole locations. I don't know why I am unable to get boreholes generated as tubes to appear as actual symmetrical circular tubes. Despite trying many different settings, they are generating as asymmetrical blocky shapes. Please see attached plan views at a 300% zoom level showing the inadequate representation of the boreholes generated at both a 5% and 1% of project size setting. I get the same type of results generating boreholes as tubes in terms of map units. I have also tried boreholes as polylines, which do not appear at all in 3D plan views, and exporting a 2D borehole map to a 3D file, which unacceptably renders the circular 2D borehole markers as irregularly sized jagged shapes in 3D plan view. Any ideas on how to get an acceptable depiction of my borehole locations in 3D plan views from above? My guess is that the problem may be caused by large XY coordinate values and small range of values, as can happen when using UTM meters for coordinates in a smaller area. 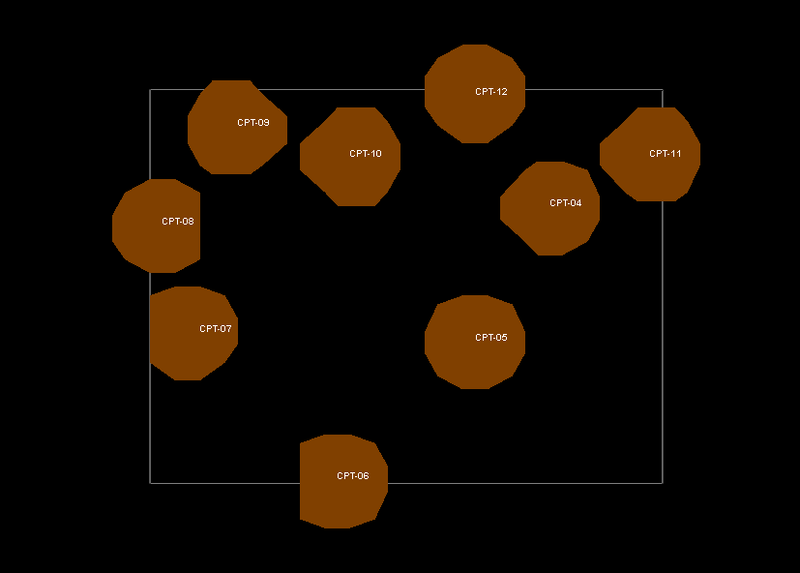 The OpenGL graphics in RockPlot/3d does not have sufficient precision to show the variation on the order of 1 m when the northings are greater than 1,000,000 and the range is small. One way to resolve the problem is to subtract a number from the northing values in the project dimensions and data to reduce the number of digits and provide additional resolution. For example, use 6,300 instead of 746,300. This was reported by someone else in 2013 (forum topic 2079 titled Multi-log 3D distorted columns). If this suggestion doesn't work, then please zip up your project and send it to tech @ rockware.com. We would be happy to look into this further. Thanks for the prompt response, Alison. Yes, my project is only about 55' by 20' and it is currently expressed in StatePlane Coordinates (thus ranging in the millions in terms of absolute values). So it does appear to be the same problem reported in January 2013. Setting up a dummy coordinate system for RW is not particularly desirable in my case since it would leave the project incompatible with other import/export datasets currently in use (such as CAD drawing overlays or GIS features). Starting from scratch, altering all the data, and rerunning all the 3D plots and exports would also take a significant amount of time. This is obviously something I will need to consider the next time I need to run a similarly scaled project. Have any programming solutions to the OpenGL limitation been found in the past year? Or is RW simply not able to render these types of graphics for small scale projects set in typical standard coordinate systems? All my models are pretty large files (each one is ~150 MB zipped). Please let me know if it would it be all right for me to send you only the RW project .mdb since we are just considering borehole locations right now.